Written in the voice of Radagast the Brown, and available in both Elvish and Dwarvish, the new study maps the climate of various locations in The Hobbit and Lord of the Rings. Scientists from the University of Bristol have documented the various climates in J.R.R. Tolkien's world in The Hobbit and Lord of the Rings. Not only does it research the fictional world in a scientific way, but it also presents it in an in-universe way. Written from the voice of Radagast the Brown, a wizard greatly knowledgeable about plants and beasts, the paper discusses results of a climate model simulation of Middle-Earth. 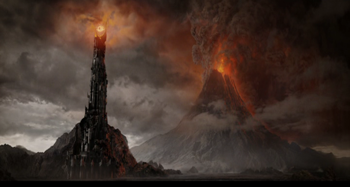 According to the study, Mordor shares a climate with Texas and Los Angeles, and the Shire's climate is similar to that of Lincolnshire and Leicestershire in the UK. The study goes beyond mapping similarities of climates in our world to climates in Tolkien's world; scientists describe the effect of heat and drought on Mordor's vegetation and the rain-shadow effects of the Misty Mountains. Scientists used a climate model similar to the ones the United Nation's Intergovernmental Panel on Climate Change report used. "Because climate models are based on fundamental scientific processes," Richard Pancost, director of University of Bristol's Cabot Institute, said, "they are able not only to simulate the climate of the modern Earth, but can also be easily adapted to simulate any planet, real or imagined, so long as the underlying continental positions and heights, and ocean depths are known." Tolkien was undeniably a great world builder, and judging by the paper, the writers are fans of Tolkien's work. Co-author Dan Lunt said the work was "a bit of fun," but plenty of the work was serious. "A core part of our work here in Bristol involves using state-of-the-art climate models to simulate and understand the past climate of our Earth," Lunt said. The scientists compare evidence of past climate change to better predict the climate of the future. The paper is available to read in English, Elvish, and Dwarfish.